1. Email claims to be from Huntington Bank asking you to confirm your account data by clicking on the link. You will be taken to a spoof login page where your details will be captured by the phishers. 2. Huntington Bank never send users emails requesting details in this way. 3. 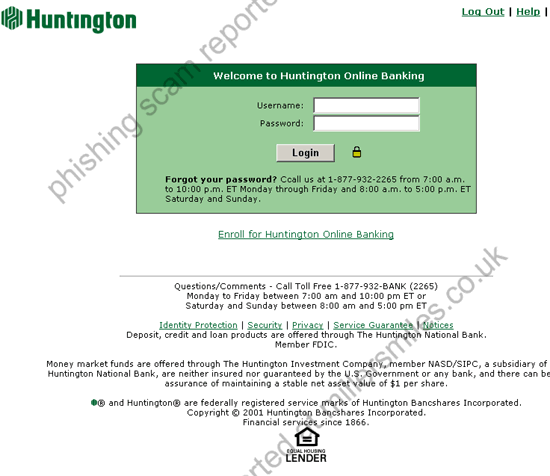 URL disguised as https://onlinebanking.huntington.com/security/login.jsp. Looks secure (https) but is not! 4. Website traced to Cupertino, USA. 5. There is a lot of bad grammar and wrong spellings used in the email and the website - a sure sign of a scam.
" To provide our customers the most effective and secure online access to their accounts, we are continually upgrading our online ervices. "